January 30, 2011 - Sonex Aircraft announced that the number one prototype of the new Onex single-place, folding-wing kit aircraft made its first flight on Friday at Wittman Regional Airport in Oshkosh, WI. Piloted by Sonex General Manager, CEO, and Onex designer Jeremy Monnett, the AeroVee-powered N111NX made an extensive flight orbiting the field. Monnett also made a low approach before landing, signifying his satisfaction with the initial handling and performance of the aircraft. "The airplane is sweet," commented Jeremy Monnett upon landing. "It feels great!" In celebration of the achievement, the "Corsair-style" wing-fold system was used to stow the aircraft back into the Hornets' Nest R&D hangar. "First flight of the Onex marks the beginning of our flight test program for this innovative new design," continued Jeremy after the flight. "A design that virtually everyone in the community of current and prospective Sonex Aircraft builders is very excited about. This folding-wing, aerobatic, sport pilot aircraft offers enhanced freedom and affordability, continuing the Sonex tradition of lowering the cost barriers to flying." More information about the Onex can be obtained by watching an upcoming Onex webinar to be hosted by EAA and presented by Jeremy Monnett on February 2nd at 7:00pm central time. Additionally, more Onex progress updates will continue to be posted to the Hornets' Nest Research and Development web site as flight testing continues. Sonex Aircraft?s Sonex and Waiex sport planes, and the Xenos sport motorglider offer outstanding performance in an easy to build, easy to fly kit package that can be purchased and completed with full technical support at an unrivaled price. Sonex and AeroConversions product development is committed to providing simple, elegant and low-cost solutions for sport flying. 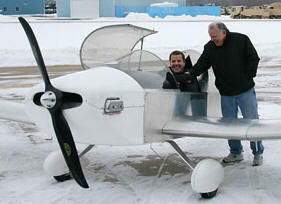 Simply put, Sonex Aircraft and AeroConversions products provide the best performance per dollar. For information visit their sites Sonex and AeroConversions.